Bakko, Watertown's new police canine, lives at home with Officer Tim Engel. The two make up the department's K-9 unit. The dog was named Bakko, an alert German shepherd dog, is 3 years old. Five months previous he left Germany for the first time when he was flown into Wisconsin. In Germany Bakko was deemed a "Schutzhund 1," a prestigious championship title judges award to dogs that prove they can perform various areas of police patrol work, such as apprehension of criminals and building searches. In 2000 he became a K-9 police canine. Watertown Police Officer Tim Engel helped get the canine unit in Watertown on its feet. The Watertown Police Department primarily established a K-9 police to counter an increase in drugs in Watertown. He also is trained to search for missing persons such as children and Alzheimer's patients. Several contributed donations to the police department's new K-9 unit. Dr. Roger Gooch of Animal Health Center; and Dr. Larry Sirinek of Animal Health Center. The police department funded the K-9 unit without taxpayer money. Start-up cost for the program was covered by several donations, including $16,000 from the Kennel Club of Watertown, which donated the money after it closed. Before Watertown he was in Campbellsport for several months, training at Steinig-Tal Kennels. There he was instructed in obedience, aggression, building searches, officer protection and narcotics. Obedient and tempered dogs can be trained to locate drug odor and scratch at the source. Bakko helped with two drug arrests during traffic stops on his first day with the force. To keep his skill in drug locating refined, Engel sometimes takes Bakko to the city's impound lot, the site of junked or abandoned vehicles. In one of the cars the handler hides a towel that has a scent of marijuana, cocaine or heroin. March RETIREMENT OF BAKKO, Department’s first police canine. Bakko, the Watertown Police Department’s first police canine, died in his sleep. He was just over 12 years old. Bakko was born in Germany and served the Watertown community faithfully for five years prior to his retirement in April of 2005. 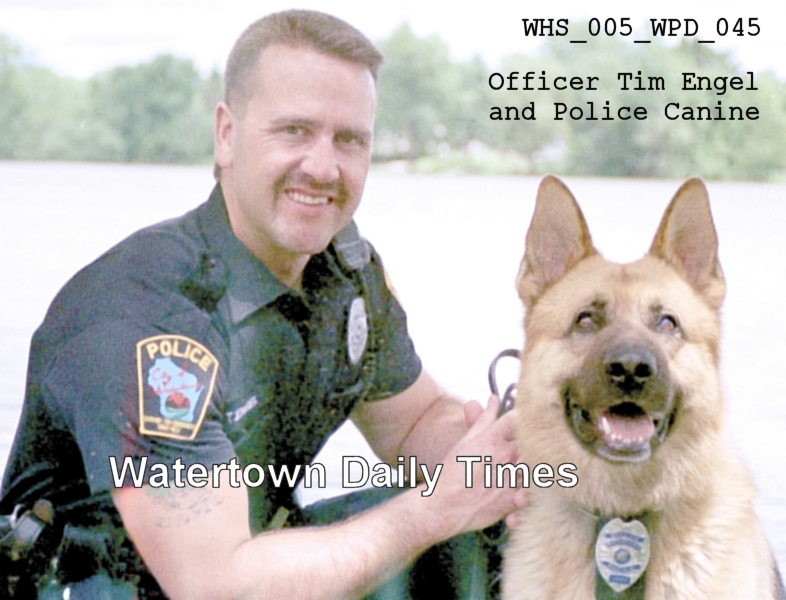 Bakko began his service with the Watertown Police Department in March of 2000. Trained as a “dual-purpose” dog, Bakko was an accomplished drug dog and tracker with specialized training in building searches and officer protection. Back row [l-r]: Chief Timothy Roets, Capt. Curt Kleppin, auxiliary officer Greg Bruske, Capt. Robert Kaminski and Capt. Mark Meddaugh. Karen Oestreich of the CPAA, and George “Soapy” Oestreich of the CPAA. 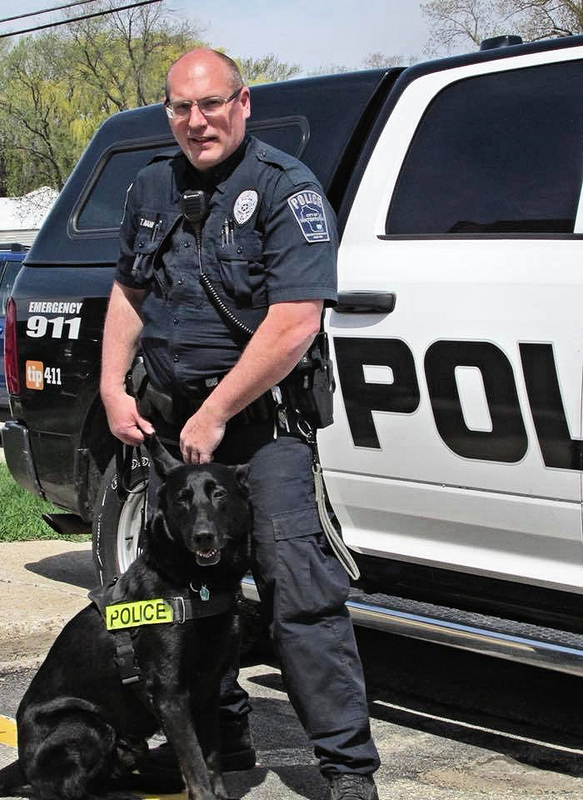 The Watertown Police Department is once again looking to implement its K-9 program. Officer Anthony Namio has been chosen as the department’s new K-9 handler and will be receiving training in the near future. The department is currently looking at a number of kennels throughout the Midwest in hopes of finding the very best dog to serve the community. When a dog is selected and trained, Namio will welcome the opportunity to give demonstrations and presentations. 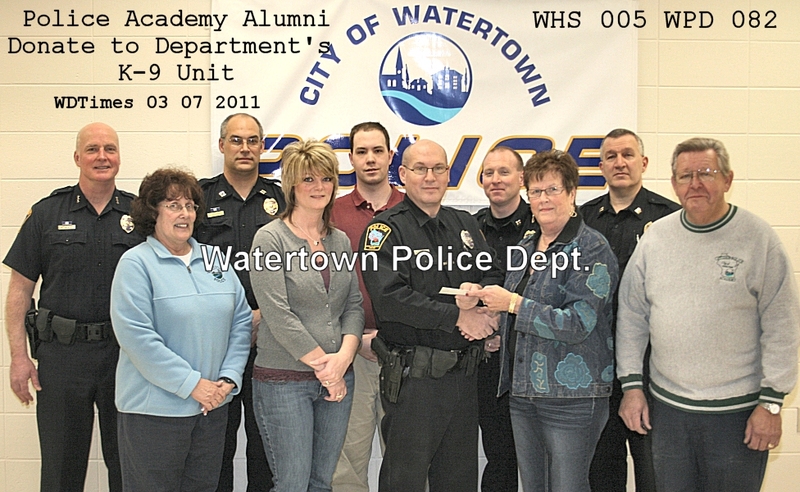 The Watertown Citizens Police Academy Alumni recently held a fundraising event at Turner Hall that netted $4,085 for the department’s K-9 program. Over five years ago the police department retired Bakko, Watertown’s one and only K-9 officer. Bakko passed away in May of 2009. Bakko was born in Germany and served the Watertown community for five years prior to his retirement in April of 2005. 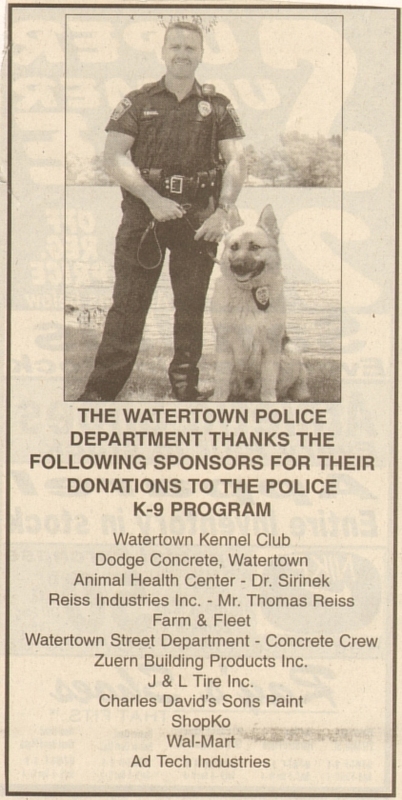 The original Watertown K-9 program was started from seed money provided by the disbanded Watertown Kennel Club in late 1999. According to a press release, the Watertown Police Department made 160 arrests for the possession of drugs and drug paraphernalia in 2008 and 243 arrests in 2009. The Watertown Police Department has initiated a K-9 Fundraising Campaign. The department’s current K-9 team of Officer Tony Namio and his partner Oeczi remain active, but Oeczi will be taken out of service in 2019 due to his age. 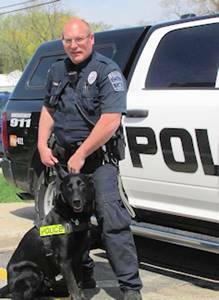 Officer Tony Namio and Oeczi went into service August 9, 2011 and its anticipated Oeczi will be able to serve eight full years before retiring with the Namio family in 2019. Department statistics show Oeczi’s has been utilized 353 times since his certification in August of 2011. Oeczi alerted to over 300 grams of marijuana and hundreds of drug paraphernalia items during his 295 traffic related drug sniffs. In addition to marijuana, Oeczi has located heroin, cocaine, methamphetamine, and ecstasy. In addition to drug sniffs, Oeczi was used to track 60 individuals who fled from either a crime scene or from a police officer by following the subject’s odor. The department hopes to raise sufficient funds to purchase a new dog in early 2019 so that a trained K-9 team is in service prior to Oeczi’s retirement. Through normal budgetary planning the department has already purchased a marked squad car for the new K-9 team and through the generous donation of $2,811 from Calvary Baptist Church the new squad car will be outfitted with a K-9 rear cage compartment. The K-9 squad will be used for general patrol until a dog is purchased. 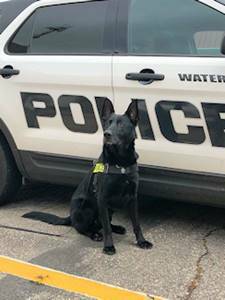 The Watertown Police Department plans to purchase the new K-9 from Jessiffany Canine Services, LLC Iron Ridge, WI. The initial cost of the dual-purpose dog will be $10,000. Dual purpose dogs are certified in narcotic detection, handler protection, tracking and article searches. During Oeczi’s tenure a total of 62 building searches were accomplished. Sending a dog into a dark building were suspects may be hiding is far safer and faster than sending an officer in to do the same task. In addition, Oeczi has located 15 articles that suspects had discarded as they were fleeing on foot. One article was instrumental in solving a homicide which occurred in 2014. The dog will be imported from Europe and will be a German Shepherd, Dutch Shepherd or Malinois. An additional cost of $3,000 for four weeks of training to certify the K-9 team is required after the dog is purchased. Continuous training for K-9 teams does not stop after certification. The Supreme Court strongly suggests that K-9 teams should strive to achieve 14 hours of training per month. The department also anticipates expenditures associated with materials to build a kennel at the handlers home and future equipment and monthly training costs. The department is hopeful to raise a total of $18,000 to get the new K-9 team up and running and to sustain the additional equipment needed for training purposes. 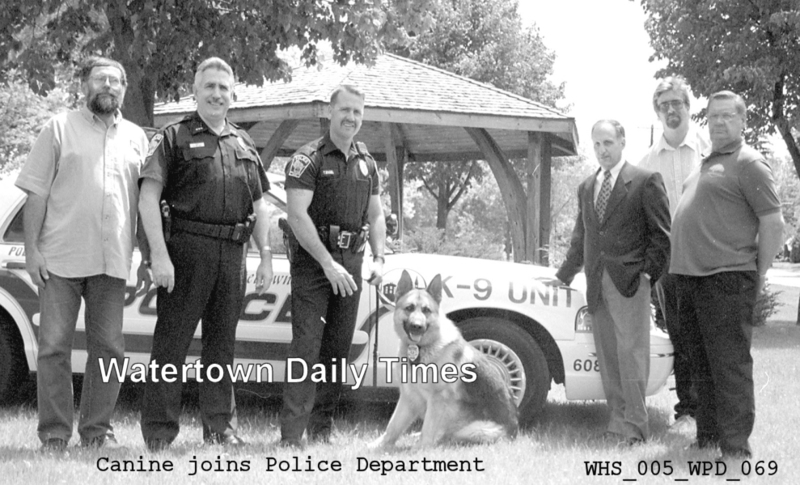 The Watertown Police Department’s first K-9 was Bakko, a German Shepherd, which began his service in 2000. He was paired with Sgt. Tim Engel and was also trained as a dual-purpose dog. Bakko served the department and community faithfully until his retirement in 2005. Bakko lived out his retirement with the Engel family and passed away in 2009. 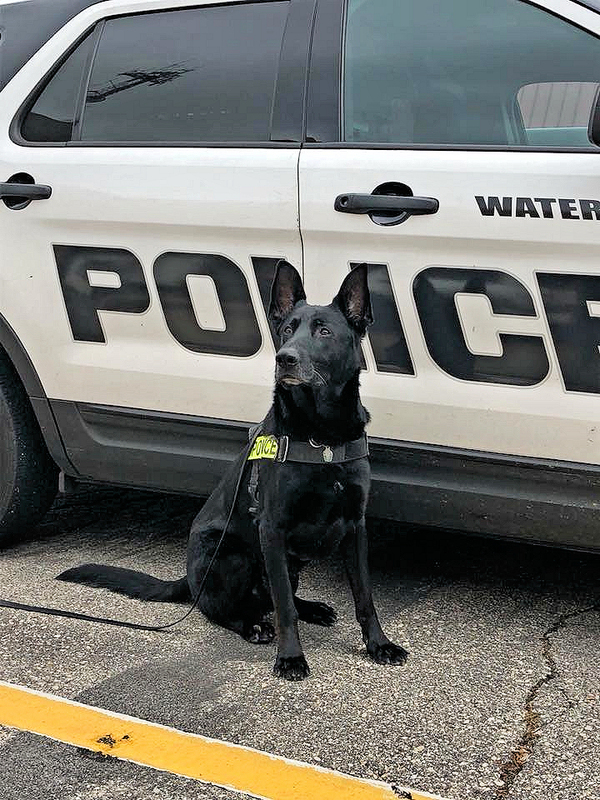 A selection process was recently completed to pick the next Watertown Police Department K-9 Officer. Officer J. Luke Hensley was selected to fill the role. Officer Hensley has served on the department for three years and he is also an Officer in the Wisconsin Army National Guard.